Claim up to £600 cashback on appliances! 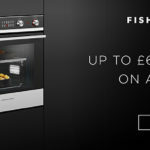 Spend a minimum of £3000 on Fisher & Paykel appliances (excluding accessories) in a single transaction, from us, between 16 January 2019 - 30 June 2019 and be eligible to receive up to £600 cash back. 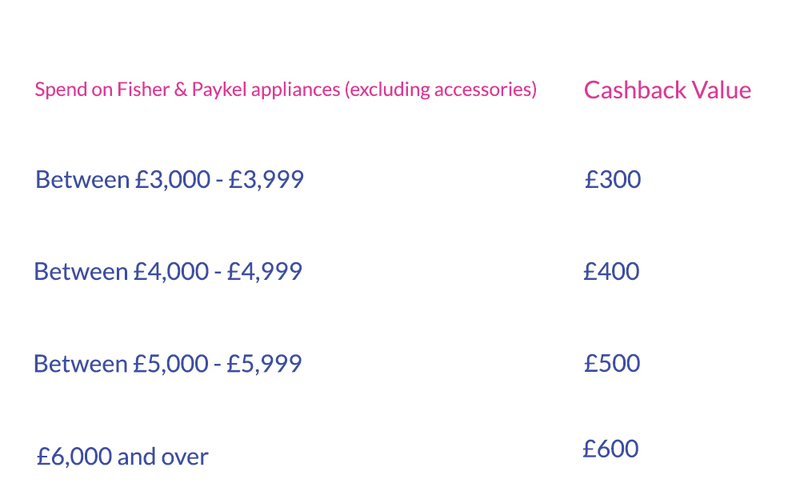 In order to receive your cashback you need to have purchased two or more Fisher & Paykel appliances. Online registrations close 30 July 2019 after which no further claims will be accepted. Once we have received and validated your cashback claim you will receive a pre-paid MasterCard or BACs money transfer within 30 days of the claim submission. How much will I receive back? What do I need to do in order to receive my cashback? How do I upload a copy of my proof of purchase? Scan - scan your proof of purchase & save as a PDF and upload to your claim. Photo - take a photo of your proof of purchase from your smartphone & make sure it is in focus & legible. What do I need to do if I have not received my cashback? If 30 days have passed since you have submitted your claim and you have not received your BACs payment or pre-paid MasterCard, please email us . Please ensure that you include your full name, contact number & unique confirmation of claim code (found in your confirmation of claim email). Alternatively you can call 0800 048 8927, please also ensure you have all the above details to hand. My product is on backorder. Can I still claim my cashback? Yes. If you place an order on a qualifying appliance(s) during the promotional period and a product(s) is on backorder ('out of stock') you must still register your claim by 30 July 2019. Your proof of purchase must indicate that you paid a deposit on the qualifying product during the promotional period (16 January 2019 - 30 June 2019) and made full payment by 30 July 2019, prior to submitting your claim. Information on how to claim the cash back forms part of these Terms and Conditions. Participation in this promotion is deemed acceptance of these Terms and Conditions. This offer is not valid in conjunction with any other offer, unless otherwise advised. This promotion is only open to residents of the Great Britain, Channel Islands and Isle of Man aged 18 years and over. Employees (and their immediate families) of the Promoter, participating retailers and agencies associated with this promotion are ineligible for this promotion. This promotion is not open to trade (commercial) or wholesale customers. This promotion applies to purchases of A grade products only and does not apply to purchases of trade seconds or refurbished products. The promotion commences GMT 16 January 2019 at 00.01am and closes GMT 30 June 2019 at 11.59pm (Promotional Period). Claims must be received by the Promoter by 30 July 2019 at 11.59pm (Claims End Date), any claims received after this date will be ineligible. Purchase needs to be made in one transaction. Purchase one or more Fisher & Paykel appliances (appliances only - excludes accessories, delivery, installation, warranty costs or any other associated items or costs) (each a Qualifying Product), from a Fisher & Paykel retailer during the Promotional Period and be eligible to receive the cash back payment relevant to your spend level. This promotional offer is available on the current range of Fisher & Paykel appliances (excluding accessories). For full Fisher & Paykel range - see your retailer's website or visit our website. This offer is available nationally at all Fisher & Paykel retailers. Please see our dealer locator for locations. Registrations close on the 30 July 2019 after which no further claims will be accepted. Claimants must agree to these full Terms & Conditions on the online registration form and supply the information marked as mandatory, including providing proof of purchase (or proof of finance/payment agreement). Name and Contact details - name (which must match the name on the proof of purchase), physical address (not a PO Box), email address and daytime contact phone number. If you wish to receive a BACs transfer, instead of a pre-paid MasterCard, then we will also need your bank account details including Account Number. The Promoter accepts no responsibility for a Claimant submitting incorrect bank account or other details. You can supply your proof of purchase by either scanning or taking a photo of your proof of purchase and uploading it to your online registration form. Claimants must retain the original proof of purchase. Failure to produce the proof of purchase when requested may, in the absolute discretion of the Promoter, result in the invalidation of a claimants claim and forfeiture to any right to the cash back. Purchases must be paid for in full and from the same participating retailer on the same day. Lay-bys will not be eligible to claim the cash back unless paid in full by the end of the Promotional Period. Qualifying Product(s) purchased under finance or payment agreements are eligible to participate in this promotion. If a Qualifying Product is on backorder ('out of stock') the required deposit on that product must be paid during the Promotional Period to be eligible for this offer. Full payment and receipt of the Qualifying Product(s) (and therefore access to the product serial number) must occur before the Claims End Date (GMT Tuesday 30 July 2019 at 11.59pm) in order to lodge a qualifying claim for this promotional offer. If your claim is approved an approval email will be sent to you at the email address supplied in your claim. If you do not receive your cash back within 30 days from receipt of your approval email, please email us (fisherpaykelpromotions@360incentives.com) and include your full name, contact number and unique code (from your approval email). The claimant is responsible for providing correct bank account details. If the bank account details provided are incorrect and payment of the cash back cannot be completed, your claim will be declined and the Promoter will contact the claimant to advise that payment cannot be made. The claimant will then be required to submit to a new online registration form with the correct details. Other than as set out here the bank account details provided in the online registration form cannot be changed. The claimant agrees that if they have obtained the cash back but then return any of the Qualifying Product(s) (under any returns policy the store may have) they will also return the cash back to the Promoter. The Promoter accepts no responsibility for lost, delayed, misdirected, incorrect or illegible claims. Incomplete, incorrect, illegible or indecipherable claim forms will be deemed invalid. Except for any liability that cannot be excluded by law, the Promoter (including its officers, employees and agents) excludes all liability (including for negligence), for any personal injury; or any loss or damage (including loss of opportunity); whether direct, indirect, special or consequential, arising in any way out of the promotion, including, but not limited to, where arising out of the following: (a) any technical difficulties or equipment malfunction (whether or not under the Promoter's control); (b) any theft, unauthorised access or third party interference; (c) any claim that is late, lost, altered, damaged or misdirected (whether or not after receipt by the Promoter); (d) any variation in prize value; (e) any tax liability incurred by a claimant; or (f) participation in the promotion. The Promoter collects personal information in order to conduct the promotion and may, for this purpose, disclose such information to third parties including, but not limited to, suppliers, or use such information to contact the claimant in relation to this promotion. Receipt of the cash back is conditional on providing this information. In addition, if the claimant checks the relevant box in the claims form when registering a claim, the Promoter may use the claimant's personal information provided at the time of collection for the purposes specified in the claims form. Claimants should direct any request to access, update or correct information to the Promoter. All claims become the property of the Promoter. The Promoter is Fisher & Paykel Appliances Limited of Maidstone Road, Kingston, Milton Keynes, Buckinghamshire, MK10 OBD, United Kingdom.